They don't have all the details about it on the web site, as Lynettea received a special letter from the lady in charge. We had a quiet Christmas as Lynettea got quite ill with gastroenteritis for days and couldn't do anything. I had to sit in front of her on a small table and keep staring at her to make sure she didn't pass away. I thought she was going to go a few times, but my efforts helped her pull through. When she was a bit better I sat on her most of the time to make sure she kept breathing. It was exhausting work and consequently I am having to rest a lot now. Fortunately she was able to get to the chicken shop just before it closed for Christmas. She looked terrible and there was also a heatwave, so I was impressed that she managed to walk down the street. Worried too. It was a relief when she reappeared and I smelt the hot savoury smell of the sage stuffed chicken wafting down the hallway. Otherwise it would have been a lean Christmas for me. Today Lynettea wrote my Important Letter to the RSPCA. She put in it all about me (as she sees it, so not all that accurate) because she is requesting them to look after me as a Bequest Animal if anything should happen to her. She has left money in her will and spoken to the Bequest Animal lady who explained the program to her. 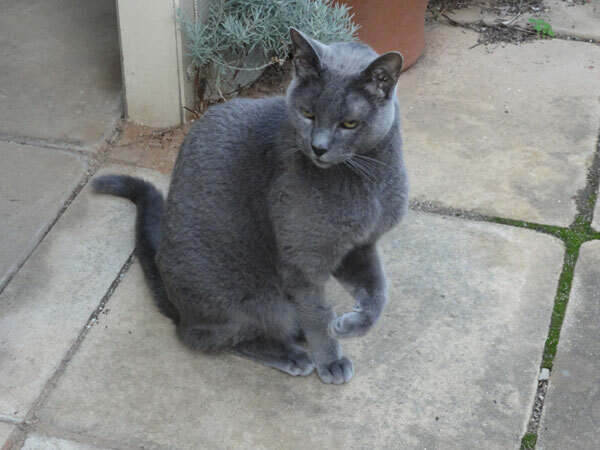 Bequest Pets are looked after by special people who are on a waiting list to look after these special pets. The RSPCA still looks out for the pets and is their 'owner', so they pay for Vet bills etc and look after the pet for the rest of their life. I am now waiting to receive my special Bequest Pet tags, or tag. I don't think I really want to be a Bequest Pet, as I would prefer to stay here. So I will have to try to make sure Lynettea stays healthy and can look after me. I will have to start supervising her more closely as to her diet and exercise program. Also she needs to remain mentally stimulated. I am already working on some of these issues. One of her visitors today commented that I was very vocal. It is awkward, as I have to issue instructions constantly. The question remains: will she ever be fully trained? The picture shows me resting after a training session. As you can see it was a tiring session. Lynettea said she read a poem about me at the Box Factory Market on Saturday. She said people chuckled when they heard it, which isn't very nice. She says her poem was realistic, but I don't think so if people were smiling. I do my best to be taken very seriously and this will undermine my credibility. Well the atmosphere around here is intense. Lynettea needs to practise her haiku sequence for the launch this afternoon. She hasn't chosen something of mine to read. I wonder why. Spent most of the night sleeping on one of Lynettea's hats on a small table in the lounge room. It wasn't all that comfortable. She was trying to entice me to sleep on a chair in the bedroom, but I chose not too. 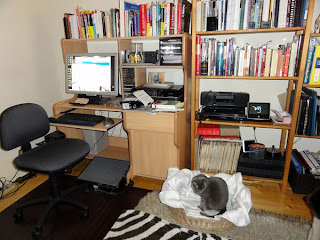 The bedroom is getting so full with my basket on the floor and now the extra chair. I did sleep in the basket for a few nights over a month ago, before I got the Arthur medication. I gave up sleeping on the bed after I fell out twice and jarred my legs. Woke up at 6.30 and threw up a large hairball. After that I waited on the dressing table for Lynettea to struggle out of bed. I tend to leap onto the dressing table and throw all the unneccessary papers to the floor. A bit like the end of a ski-run as I leap from the chest of drawers. Lynettea says she is at her wits end. What does that mean? She isn't used to all my pro-active help in tidying up. I think I will go outside and sit on my upper sundeck for a while. My haiku are in this book called Haiku Bindii which is being launched on 3 December. Lynettea said I can't go and read my poems, as no one would understand what I am saying. 'All they will hear is miaow miaow miaow, Diamond,' she told me. How rude! Some of the poems are also by Lynettea and by other poets in her group. She said they all know which are my poems, as they are mostly cat or moon poems. Although some of my poems are now on other topics. Lynettea went to get more Arthuritis medicine for me at the Vet today. The receptionist told her to mix my fresh roasted chicken pieces with my dry kidney food to see if I would eat it. So Lynette tried that and I didn't eat it. I did pick at a few pieces. So she had to go to the shop and get fresh chicken and then I ate some. Labels: my poems published in book, not invited to book launch, unjustified criticisms of ME. Lynettea says she is about to give me my medicine on a little spoon. I am looking at my little red striped toiletries bag and purring. My bag has my Catlax, my brush and my new Arthur medicine. I think she had better hurry up while I am still purring. I am about to dissect the packet. Hurry up! Hurry up and where is my plate of chicky chicky. What I really like is smorgasbord. A plate of dried food with at least two choices ( I can eat one and leave the other until desperate), a plate of fresh chicken (preferably fresh and hot from the chicken shop) and some of my foil packed kidney food (I like to lick that all over and Lynettea can throw out the dried remains). Well she is a slow coach - I have knocked my toiletries bag to the floor and also my Arthur packet. She will have to look after me now. Is what the vet says I have. It sounds silly. arthur wrong us. arthurwrongus. I am not sure who arthur is. Maybe he came to visit when I was quite young and don't remember, although, in spite of what Lynettea thinks, I have an exceptionally good memory. I have to take some medicine squirted with a plunger, which is quite difficult for Lynettea. Although my Vet carefully showed her how to do it twice (as it is very important and affects ME ME ME) she still isn't very good. I don't like having my mouth jerked open, but the taste is quite nice. She needs to go to the chicken shop very shortly. 'You are developing quite a nasty miaouw' she said to me this afternoon. And that was after I had sat on her lap to make her feel wanted. 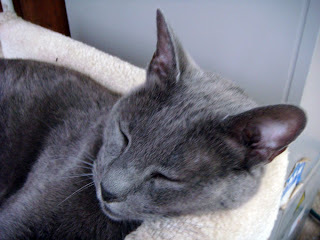 Maybe I will go to sleep now and let her wake me gently to brush my fur and feed me a few tidbits. A nice dream. Labels: arthur right us, managing the human. Lynettea didn't seem to want to nurse me and she put me on the floor when I tried to use the keyboard. so I am sitting on some of the papers and feeling a little bit sleepy and droopy or dropy. Diamond seems to be jumping up and missing his footing. Sometimes he falls off things. A few nights ago he fell out of bed twice and last night he fell from the bedside chest of drawers. I put a basket for him to sleep on the floor beside the bed and he went there for a while. I think I will take him to his medical practitioner for a check. Diamond: I saw that. She thinks I don't know what 'medical practitioner' means. I am having trouble getting her to let me at the computer lately. Sometimes I sit on the external hard drive for ages staring at her. You would think she would get the message. As Lynettea has often been running to the chicken shop to get a hot chicken wing quarter for me. The people at the shop at the end of our street know it is for me and they select the best one. They are very interested in how much I eat and how I like it. I am eating a whole chicken quarter every two days. On the day when I am finishing off the chicken quarter from the previous day I also eat a foil packet of my kidney diet food and pick at some of my kidney diet and teeth crunchies. Lynettea keeps shifting my plate and looking at me while I am eating. I have no privacy nowadays. The weather is getting hot and my fur is moulting. Russian cats have a lot of underfur. Lynettea has to brush me a lot to get rid of the loose fur. So that is my life. Not so fascinating perhaps. I sit on the external hard drive to meditate. That is quite difficult, as I have to gather in my paws and sit quite still. Maybe I am meditating and maybe I am half asleep. Lynettea doesn't know and I am not about to tell her. Living in a strict Vegetarian household is not easy. On Sunday a friend of Lynettea's came round bringing her lunch and brought me a new smell sensation. I am choosy with my foods and Lynettea buys me special Vet type food for my kidneys and my teeth. I sniffed a most savoury smell and tried to get a bit closer. I was in a frenzy of anticipation as she took off the cover. Lynettea tried to make me stay inside, but I managed to get around the door, as I am still quite agile and her friend said not to bother, as she didn't mind if I sat close to her while she was eating. After she had finished her food there was still quite a bit left and she offered me a a few pieces. Delicious, savoury. I seized a large chunk and bolted it down with a few chews. So she decided to leave me the rest of the chicken. The next day Lynettea went down to the chicken shop (what a nice kind of shop - I would like to go there) and brought me back a quarter chicken. As soon as she opened the packet I tore into it, devouring large chunks. It may be my favourite food. Just in case you are wondering about my strict diet, my Vet recently said to Lynettea that I should eat anything I liked, as I needed to put on more weight. Lynettea helped me make a special page for my moon haiku. I can post my haiku there so other kitties can enjoy them. Today it was warmer and sunny and I took Lynettea outside a little while. 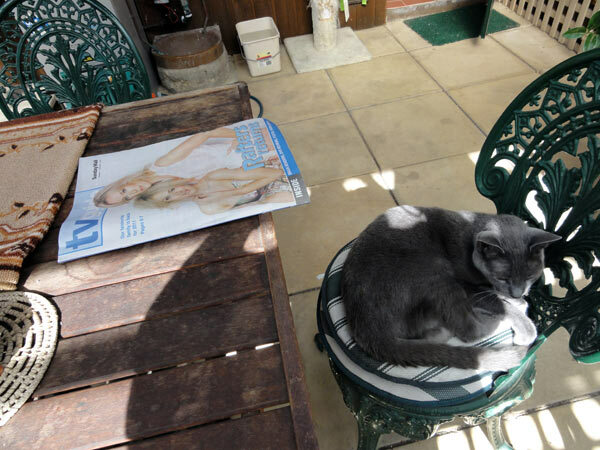 She sat in a chair near me while I sat in the sun on the top of the reverse cycle air conditioning unit. It is on the ground so I can hop up there easily. I can't leap up as high as I could when I was younger. Lynettea read a book called 'The Six Thinking Hats' by Edward de Bono. She is thinking of doing something on that with her Philosophy group. I was glad to see she was sitting quietly and improving her mind. We cats don't need to read about thinking methods. Edward do Bono probably got all those ideas from a cat, although he would not admit it. Much the same as Isaac Newton's cat Diamond and the falling apple problem. Gravity - you only have to watch a cat leap to learn about that. Anyway, after a while sitting together and relaxing, she decided to go and get herself some nuts for afternoon tea and brought out some of my kidney diet crispies for me and put them near me where I was sitting. So we both had a snack. So maybe she does need me a bit. Does she need me to help her anymore? Sometimes I wonder if Lynettea still needs my help. She is so busy with the other blogs she made that she forgets I still need time to connect with my own friends. Also she is very nasty about shutting me out of the room when she is preparing food. I don't know why that is. I am concerned that if she doesn't let me sniff at the food she may try to eat something bad. She knows that I have a much more developed sense of smell than she does. So I sit and wait and sometimes I wonder what I am waiting for. On Friday we had a visit from the lady who is in charge of collecting the Census information. I went up to the door, as usual, to see who was visiting. Much to my surprise, Lynettea said to her,'I suppose this will be another instance of discrimination against cats!' I wondered if I was hearing voices in my head. SHE must be telepathic. The Census lady laughed in a very inconsiderate manner, which I thought typical of a callous government official and said that pets were not included in the Census. I could see she was staring at me. I have included a couple of photos of me enjoying the sun on the windowsill. This was before I went out. Thank you Mr Puddy for this sweet award. 15 unknown facts about me. That will be hard, as I have been open about my life, narrow though it may appear to have been. 1. Did you know I once flew to Sydney by myself many years ago? 2. When I went to Sydney (without Lynettea) she strapped a Valium tablet to the top of the transport module so the Specialist staff in Sydney would give it to me on my way home. 3. They forgot to give me the tablet, so I was very nervous with all the noise in the plane. I was away a lot of time (days and days). 4. When I was sent away I didn't see the harbour view, although Lynettea told me to look from the plane window. She obviously didn't know that I would not be in a glamorous window seat. 5. ON arrival I was transported away in a special van designed to collect pets no-one accompanied. You can imagine how concerned I would have been at this point, except that Lynettea had forced me to swallow a Valium tablet before DUMPING ME AT THE AIRPORT IN ADELAIDE. So I was still quite drowsy. 6. Lynettea kept phoning me in Sydney, but she couldn't get through, as they didn't let cats come to the phone. Another instance of unusual and cruel discrimination against cats. 7. She spoke to the Specialist Neurologist, who had poked at me and given me an MRI scan to see if she could see what was wrong with me. (She couldn't). 8. So after all this travel I finally returned home in a solitary manner in my cage. 9. Lynettea went with a friend to pick me up. She was wondering if they had sent the right cat back. I felt a bit dazed after all the flying. Cats aren't meant to fly, otherwise they would have wings. No, I didn't see any puffy white clouds. 10. As further discrimination against cats they had put my transporter where I couldn't see out of the window and I didn't receive any inflight meals. 11. On my return home Lynettea made a lot of fuss of me. She said she had wondered if she would ever see me again. 12. I had to take cortisone tablets every day. 13. My specialist here could hardly believe it when Lynettea told him I seemed to be getting better. (my back leg had been giving way). 14. Lynettea after a long time started to cut down on my cortisone tablets and I still kept getting better. The specialist was very surprised when I showed him how I could walk across the floor of the surgery. 15. Then I got a lot better and was able to stop taking any tablets and could climb up the grapevine and bolt here and there. So I stopped going to the specialist and had to start training Lynettea again. She had got quite out of hand while I had been ill for all that time. At least she was a lot more cheerful now. 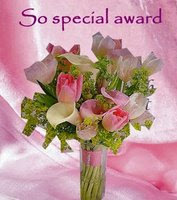 I am passing this award to the last fifteen cats who have left messages for me. Thank you kitties and your messages are all carefully read and appreciated. I only have time to load one of my photos from my photo-shoots. Maybe more later today or tomorrow. Lynettea says she is going out to see Othello, which is a play by Shakespeare. There aren't any cats in it, so she thinks I won't be interested. She must think I have a very limited view of the world. I think my photo shows me in rather a commanding pose. Enjoying the winter sunshine. A pity she got garbage bins in the background. I am wearing my diamond studded walking outfit. We just got an email letter from the people who look after my Bear Friend Emma. It has a lovely movie of where Emma lives. This is where Lynettea went in May. Emma is my Friendship Bear. I am not sure if she is in the movie, but I have a photo of her on our dresser in the kitchen. We had a special photo shoot this morning of Me Me Me, so I may have some photos for my blog soon. Once Lynettea puts them on the computer, that is. I am busy writing one of my moon haiku for a web site where I am a member. I am not sure if they know I am a cat. I don't think I will tell them, as I fear discrimination. We all know humans think they are the only ones who can do anything important. Since I have grown older I have begun to speculate about all sorts of things. Such as: what is the taste of peanut butter? what is the taste of curry? (I found that out and it is too hot and spicy for me). I had never run into the street without my jewelled halter, but a few days ago when it was sunny I squeezed under the front gate and sprang lightly up into the street tree. Unfortunately when I got to the first branch I saw people coming down the street, so was forced to jump off quickly. Lynettea tried to grab me, but I was too quick for her. She said, 'that's pretty good for your age Diamond. I hope you haven't hurt your pawsies jumping down,' and a few other insulting remarks. She knows that I don't really like 'baby talk' and as for references to my age (fourteen years and ten months), how rude. Lynettea was away most of the day. She told me she was visiting a small poodle called Maurice or Morrie for short. He must be VERY attractive. Maurice's human said she might bring him here to visit me. I DON'T THINK!!! I will have to keep looking out the window all the time. It is an awful thing if one can't feel safe in one's own home. Lynettea was reading in the newspaper about some government, which has declared that humans that keep pets should be called Guardians rather than Owners. She thought that was a good idea, but she thought that she felt more like a Mummy than a Guardian. I am not sure about that. Tonight we had another visitor. Not a small child, so I must be grateful for that. I was shut in the front of the house for a long time. I am not sure why. I was only trying to test the odour of the food on the kitchen bench. I feel responsible for Lynettea's diet, especially as it is so poor - she never eats meat, for instance. She doesn't like me sniffing at her food. I quite like to test the scent of: weetbix, nuts, peanut butter, vegemite, savoury nut loaf, crispbread, any kind of breakfast cereal with soymilk on it. After they finished eating she opened the kitchen door. By that stage I had lost interest and stayed resting on my Snugglesafe. Of course it is all, "are you alright, Diamond?" then and stroking and patting. I have my dignity to consider. I just had a small child visiting here. He was quiet at first, so I let him touch my soft and pretty furs while I lay quietly. 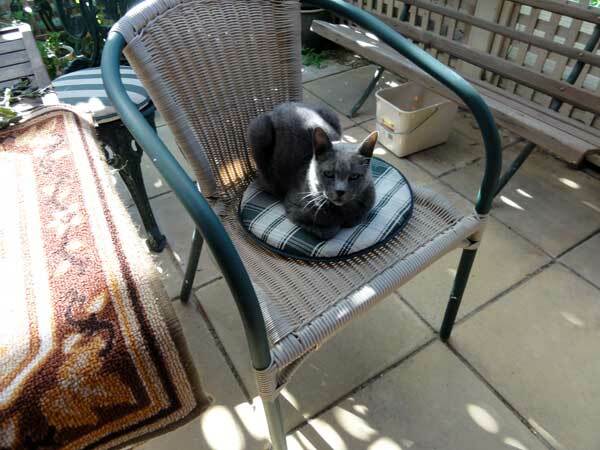 I observed him closely, but preferred to stay on my warmer for a long as cattily possible (as it is winter here). Finally, when he started jumping up and down in an excited manner I had to go. I went and sat on Lynettea's usual chair in the kitchen and busied myself quietly looking at the Japanese language lesson that she had been reading. It didn't mention any cats though, so consequently was rather boring. I am not sure why so many documents that amuse humans do not mention us. Is it a lack of appreciation or just the usual human ignorance? When the small boy tiptoed out to the kitchen he couldn't see me at first as i stayed quite motionless, hoping he would go away. Now at last I have returned to my beloved Snugglesafe and hope there will be no further disturbance for this evening. At my age I really need adequate notification of any 'lovely surprise visits'. My correspondent in Queensland, Sanka, wrote to me recently very briefly enquiring about my health. 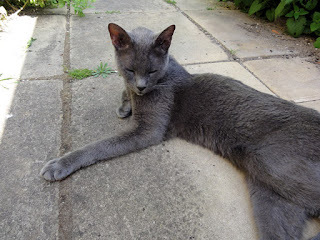 I am quite worried about Sanka, who apparently has to sleep in a shed at night, so was relieved to hear he is still in the land of the living. Whether we will ever be able to meet in the fur, I don't know. Both of us are getting on in age. 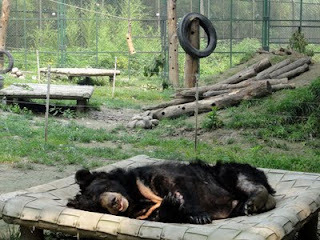 This is a disabled bear lying in a special comfortable hammock at the sanctuary. The disabled bears may be blind or have other problems which can be managed and the bears looked after so they have quality of life . These bears cannot live with the bears who are strong and vigorous, so they have special areas of their own to live in where they can feel safe and secure. 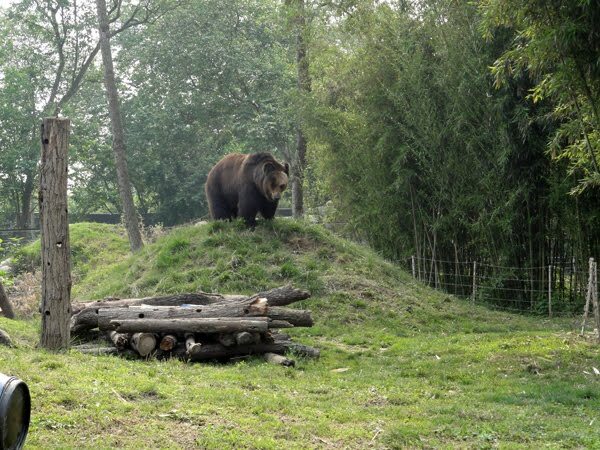 The bears in the bear sanctuary at Chengdu have sent us a special greeting, as they are so pleased to be featured on a cat blog. Kari asked me if anything can be done to help the bears. 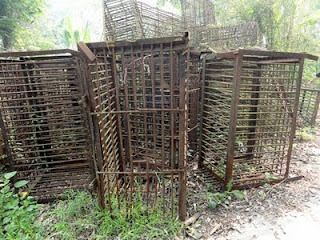 I read on the Animals Asia web site http://www.animalsasia.org/ that a lot of people in China are getting angry about the way the bears are treated. Some celebrities are publicizing the plight of the bears. WSPCA (World Society for Protection of Animals) also works to try to make people aware of the suffering of the bears. I suppose kitties could talk to their humans and those humans could let other humans know about this. When a lot of humans are annoyed about the situation perhaps they will get the Chinese government to change the laws. Quite a few of the provinces have outlawed bile farms and bears are not allowed to be caught from the wild and put in bear farms in China. Probably some humans still do that though and sometimes the bears even lose a paw when they are caught. If the people who use bear bile for medicines were to stop doing that and use some of the alternatives, then no-one could sell the bear bile anymore. Then homes would have to be found for all the poor bears in the cages. I hope they can have nice homes to live in. That is my dream. I think about that when I am lying on my Snugglesafe warmer, with the warm air from the heater flowing around me. If you can afford to give a little to help the bears you could do that too. 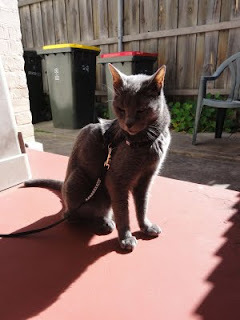 I tried most of your advice: batting Lynettea with my paw, miaowing in a 'very strident fashion Diamond', snuggling and purring, leaping onto the food preparation area, which is 'very bad, Diamond. What is making you so naughty', staring into her eyes and using my will power. Now after all my efforts she has put my friendship photos on the computer so I could put them on my blog. My photo is at the top like a guardian looking after my bear friend Emma. 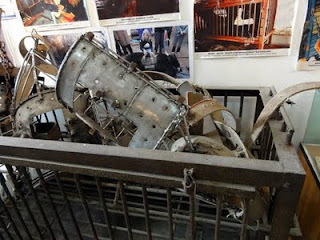 Lynettea said I could also put her photos of the type of cage in which Emma was imprisoned for ten years and Emma was also forced to wear a metal corset like those shown in the photo. I am glad Emma is now safe in her special place at the sanctuary. The bear in the grassy area is called Caesar. Caesar is a female brown bear and the one that ran up to Lynettea from where Caesar was standing on the hill. Lynettea didn't have a photo of Emma in the sanctuary. I will put some photos of the food treats for the bears and the bears in their enclosures later. the cages in which the bears are imprisoned are really small. Thank you dear friends for your advice. I am going to try all your suggestions. I have a certificate of my friendship bear Emma, but Lynettea hasn't photographed it to put in the computer so I can put it on my blog. She really does need quite a bit of retraining. I am not sure how I will manage this, as I am rather feeling my age and the cold. 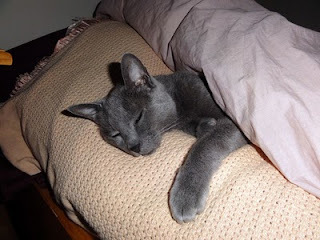 I am spending a lot of time on my Snugglesafe heating pad or under the blanket on the bed. I don't want to lose the opportunity to publicize my bear though. Maybe I need to give Lynettea some kind of a reminder.I don't like to slap at her or bite her, as she does try to look after me in her rather limited way. What do you suggest? because it might not be a good idea to hold baby pandas, I have now put a picture of pandas in the trees instead. If you think about it humans holding pandas isn't really natural. 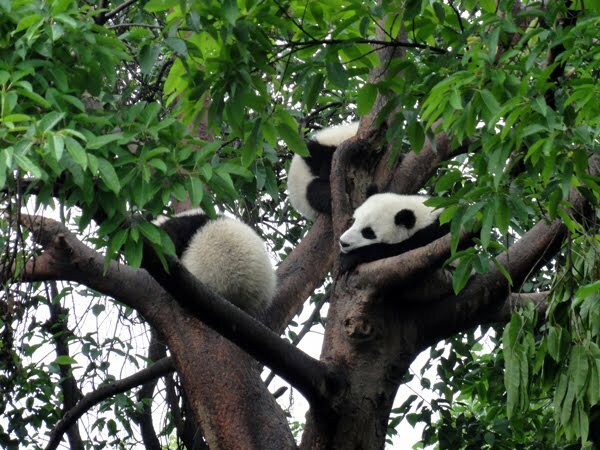 Pandas should be shy of humans, or they might adopt habits that will put them in conflict with villagers. That is what I think, as a kitty anyway. You can't really trust humans except your own human and even then you have to be careful because she might accidentally step on you. Which can be quite painful, as we all know. Now Lynettea has been away and out of my control for some time I am considering quite an extensive program of retraining her. 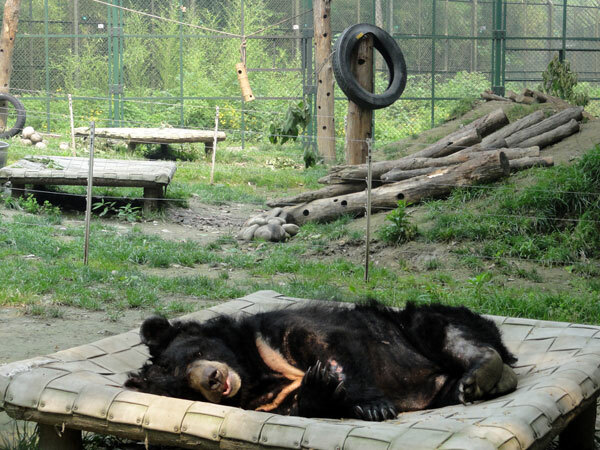 When Lynettea went to China she visited the Animals Asia bear sanctuary at Chengdu. 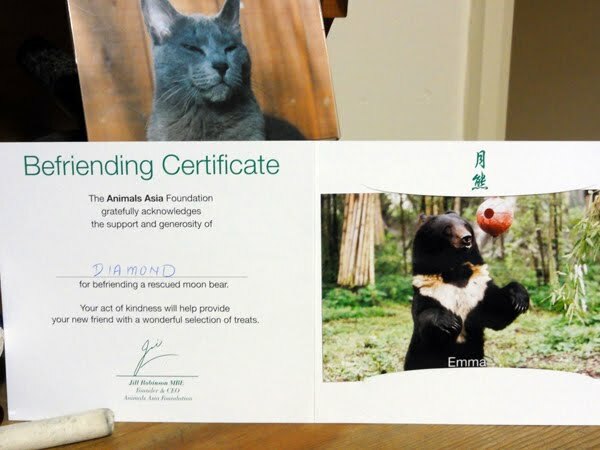 She got really upset when she saw a bear called Diamond who had been brutally treated for many years (15 or so), being imprisoned in a small cage with tubes stuck in Diamond's gall bladder to extract bile for use in Chinese medicine. 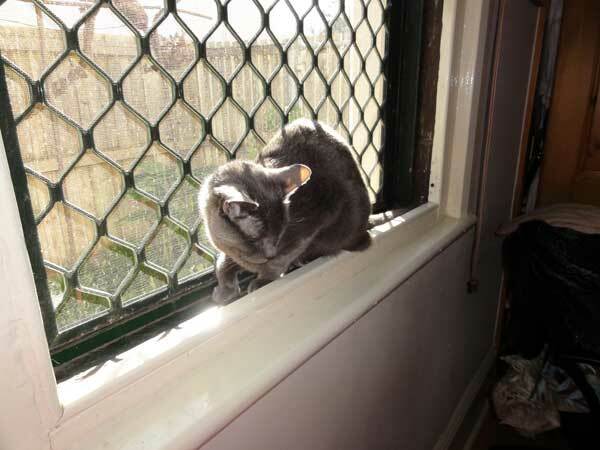 Poor Diamond, after years of unimaginable torture, is now living in a beautiful place with grass and trees, swimming pool and climbing areas, scratching post etc. After I heard about the bears' situation I was upset, so Lynettea decided she would let me befriend a friendship bear. Unfortunately Bear Diamond was not on the list of friendship bears, so I decided to befriend Bear Emma. You can read her story here. 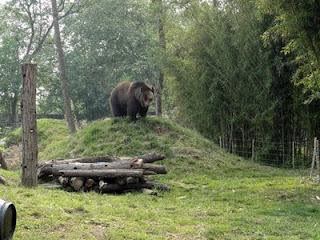 When Lynettea was at the sanctuary she was taking a photo of a beautiful brown bear standing on a hill. The Brown Bear suddenly saw Lynettea standing by herself at the fence and ran down the hill and across the paddock to say hello. Lynettea says she will never forget that. It was like meeting a huge wild friend. If any of you kitties want to read about the beautiful bears and tell your humans about their situation go to the Animals Asia web site. They also support cats and dogs in trouble in Asia. I might be able to post some photos later. 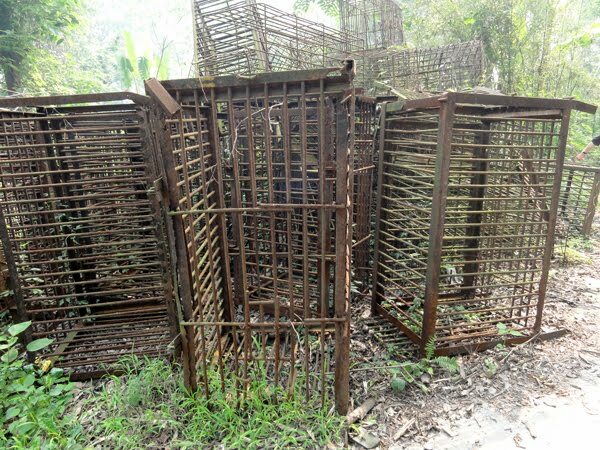 Just to correct any mistake, there are still around 94 bear bile farms in China alone, so thousands of bears are still in these vile prisons. This video is pretty shocking, so please advise sensitive human carers to keep their eyes shut while you look. They may not be as upset if they only listen without looking at the pictures. 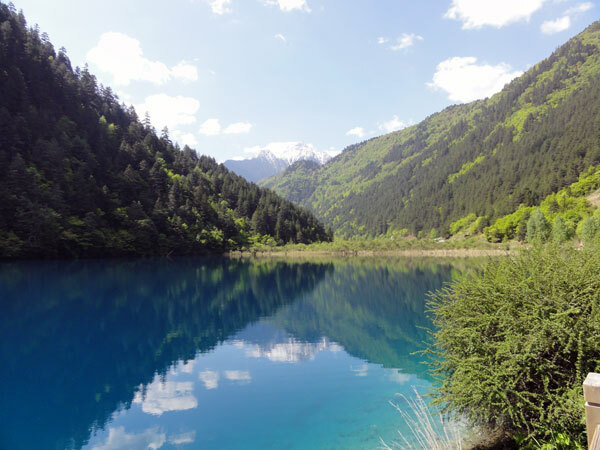 Lynettea has allowed me to look at her photos of China and select a few for my blog. It wasn't hard to choose a few, although she has so many it takes ages to load them all. After all my devotion and suffering miaouwww miaouww it was the least she could do for me. I may put up some other photos later. Well they have loaded in a higgledy piggledy fashion. One photo is of glorious me on my return home. You will be glad to see that I am still looking alert and capable. I need to be alert in this household if anything is to function. the photo of Lynettea holding the baby panda has been removed. It may not be a good idea to hold baby pandas even if you have lots of plastic garments on. 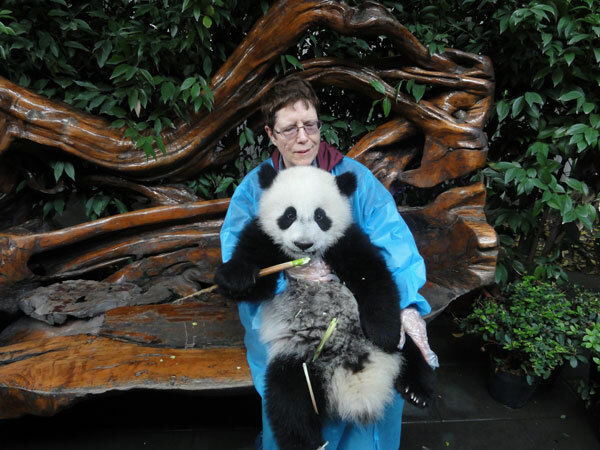 Another photo shows Lynettea holding a large and awkward panda baby. She had to put on plastic gloves (her real fingers don't look like that) and also a blue plastic robe. The panda kept chewing at pieces of bamboo while she clutched it. (It wasn't interested in Lynettea at all!) She has hold of its little leg and foot and one arm under the panda's arm to try to keep it on her lap. Then we have a photo of the beautiful Nine Village Valley. Lynettea says she doesn't think any of my kitty friends will have such a pretty photo. She walked for many kilometres on the wooden walkways around these beautiful bodies of water that ran straight from the glaciers. It was quite hot in the middle of the day after walking for hours and she wished she had taken fewer woollies and more bottled water. Maybe next time she will take me too and I can remind her. 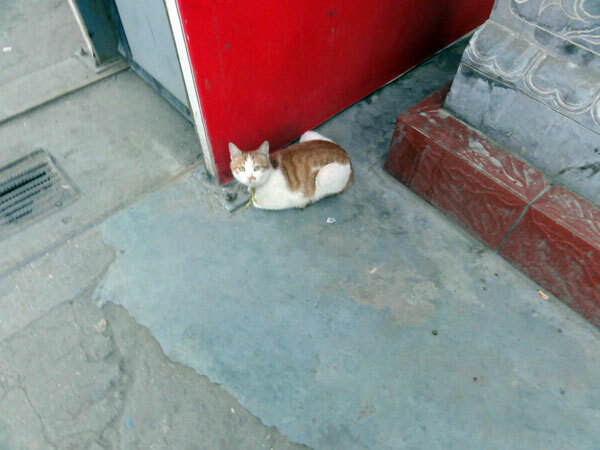 And lastly a photo of a kitty in the street in Xian (China). There was a little shop nearby and we hope that this kitty belonged to the lady in the shop. There were also a lot of spoilt looking fluffy doggies out in the streets with their owners. I barely had time to have my essentials re-packed into my little red striped bag and my big shopping bags before I was suddenly whisked back home to take care of Lynettea. Without my constant supervision she caught a bad cold in China. She told me it was really an Australian Cold, as one of the group had brought it on the tour. Anyway she is lying in bed snuffling and sniffing and I am trying to keep her warm. 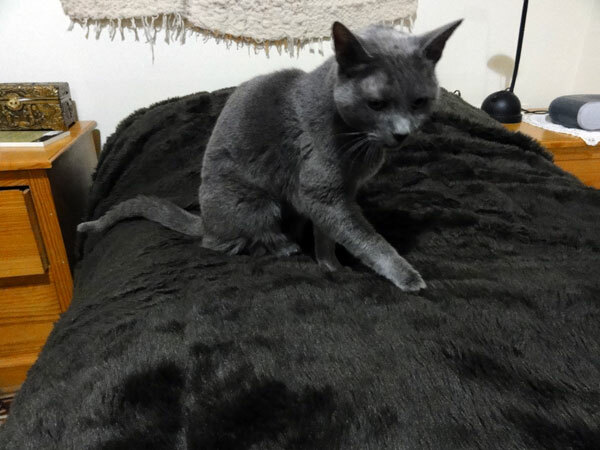 The hotel was better this time for me, as I had special luxury quarters in The Spare Room section, with a small human female designated to brush my soft furs and pat me. Lynettea says it was nice for me to have made another little friend. It is good to be back home though, in spite of all the extra work looking after Lynettea. She hasn't even put her photos on the computer yet. Diamond has asked me to post a message for him. He left at around 3 pm this afternoon. The lady in charge of the camp, Pam, collected him and let him ride in the front seat of her car. 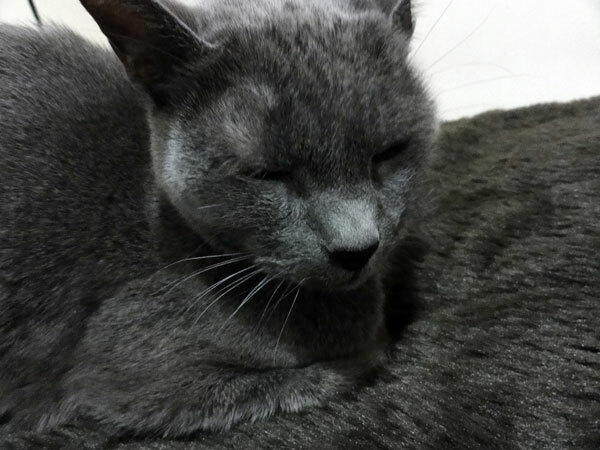 He took his two Snugglesafe heating pads and a fluffy towel to put around them, his renal dry food and a lot of sachets of his renal moist food. His cat lax and brush also went with him. Pam said she was thinking of letting Diamond stay in the camp house, so she could keep a close eye on him and make sure he is okay. So he would have a nice room to himself with lots of fluffy blankets. Diamond was eating his food better when he left, so I hope he will keep on eating while at the camp. 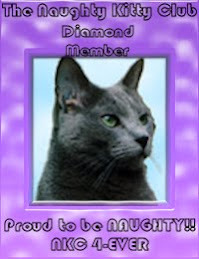 Pam has a card for Diamond's vet, if she has any questions about looking after him. How can she do this when I am in need? I have been eating up my food again and she says she is pleased with me and I must keep eating well while I am on my holiday. I must come back looking like a 'Hollywood kitty of the silver screen.' I have some of my kit packed in an Adelaide Zoo bag: my foods and a big towel and a smart red and white striped toiletries bag with my cat lax and my soft brush. My two Snugglesafes will be packed tomorrow. Now I must get a good sleep, as I doubt I will be able to sleep properly for several days. Rough cats meowing will probably keep me awake. I hope to be able to write again soon after I return. More details of my being left (abandoned). I feel like the orphans in the wood in Hansel and Gretel. Lynettea says I would be Hansel, as I am a boy cat. You can see how indifferent she is!!!! No suitcase has come out yet. I think I will stay on the sofa all the time so she can't put it there to pack. She says I can take all my special foods and my heaters and blankets with me and even my fur brush if anyone wants to brush me. I don't think anyone will brush me, as my fur was quite unkempt when I got home again last time. I am used to having my fur brushed with a soft baby brush twice a day. Will she leave me alone again? I heard her talking about going away again. Is it heartless to leave me in my less than peak condition? She keeps pestering me to eat my food. I even have to try to eat my food when I am lying down in my blankets. Miaouwwww. I cannot help it if I am thinner and bonier. I have the same number of bones, but not so well covered. I haven't been feeling well again and Lynettea took me to my Vet in the taxi yesterday. My cat carrier tipped over in the cab when the driver swerved around a corner. It wasn't pleasant being tossed against the wire bars. Strangely enough the Vet who saw me was the same Vet who saw me at the specialist emergency centre a few weeks ago. He was thinking of putting me on the drip again, but then let me come home with some medications. Lynettea has been giving me the soft food and some water while I am lying down on my heated pad. I did manage to lick up some of the food and water and then in the night used my litter tray. I have to take some Cat Lax. That sounds a bit like 'lazy cat.' Lynettea put it on my paws a long time ago, but this time she put it on her finger and let me lick it off. I was doing her a favour really, as it is difficult to remove once it gets stuck on you. Sometimes I think of her as my Ignorant Little Kitten. The picture is of me resting after reading the TV Guide. There aren't many shows of interest for the intelligent cat viewer. Lynettea told me that one of her friends told her my blog was really silly and she should concentrate on playing bingo instead. What will I do if she plays bingo instead of switching on the computer for me? She said, "Don't worry, Diamond. I don't like bingo and am not going to take up playing bingo." But I am still worried. Miaouw Miaouw. I try to offer my honest opinions, although I haven't had the chance to go to University and get a good education. But I still regard myself as a thinking cat. Lynettea got me some new food which comes in small foil sachets. When I ate some she got very excited and went down to My Vet straight away to get some more for me. It is soft food for a kidney diet. She thinks it might help me if I eat some of this food. I don't really like talking about my Bowel Movements or Using My Litter Tray. All that stuff is too personal and who else could be interested. 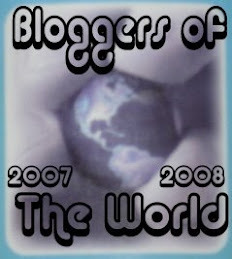 I haven't been able to get to my friends' blogs lately to post. but I will soon. I am feeling deprived not knowing what all of you are doing. 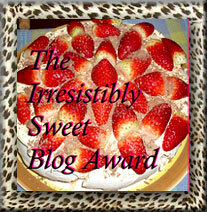 Thanks to the dear friends who have come and put your nice messages on my blog. My human, Lynettea, says I need to put on more weight. I do try, but I think I may be getting more skinny. I wonder if my bones will stick out of my furs. At the moment I am resting comfortably on my heater. We went outside into the sunshine earlier, which was nice, but Lynettea had to go out to meet a friend and have some green tea. She said she had to go out, but I really think she wanted to go. Maybe she didn't want to stay with me? Sometimes I have these negative thoughts. 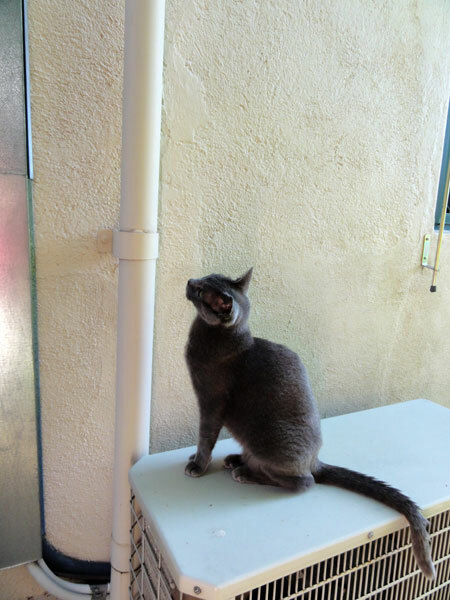 Lynettea tells me not to be negative, as it is important to have a sunny personality, not spend all your time peering into the yard next door from your pergola shelf to see if the black kitty there is doing something he shouldn't. I don't think he should be there. 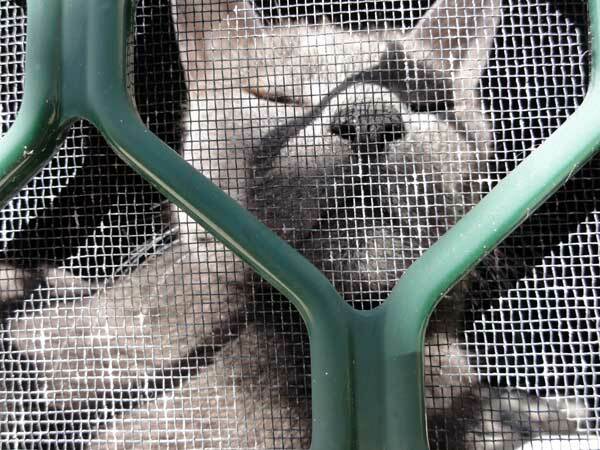 His human has built him a little enclosure so he can go out into the sunshine. When Lynettea got back she tried to go out again to look for the letters (she said) and I rushed out and the door banged into my left thigh. Lynettea said sorrry sorrry Diamond, but it did hurt, even though she picked me up and cuddled me. Of course we cats don't show that we have had a nasty knock, so I said nothing, not even meow. As she looked upset I let her give me some kisses and hold my pawsie - sorry 'paw.' She wasn't happy when she found this morning that I had been hiding some of my tablets around the house. 'I didn't know you could hold the tablets in your mouth so long, Diamond!' she said. I haven't had any tablets for ages now. I hope she doesn't force me to have any more. The picture shows me relaxing after hiding one of the tablets. Labels: personal injury, resting after work, swallowing or hiding tablets. Lynettea was at the Harris Scarfe sale today when she should have been at home looking after me. When she got up to the counter after a long queue, she saw that a lady ahead of her had a koala baby nestled up to her shoulder. This little koala was wrapped in a white cloth and peeked out at the top with his or her little arm on the carer's shoulder. The little koala seemed quite undisturbed by all the people and noise around. Lynettea didn't say Miaouw to the little one, as she said koalas don't miaouww. I don't know how she knows this. She often says things I am expected to take on trust. Dear friends, Lynettea says I should tell you at once that I seem to be better and better. I did take my tablet for a few days, but managed to spit it out this morning. I did swallow it after Lynettea said she was prepared to keep putting it in my mouth all morning if necessary. I think I may have had enough tablets by now, as I AM USING MY LITTER TRAY and EATING MY FOOD. Now I have the nice basket on the floor near my computer I often use it for grooming sessions, sleeping at night and generally relaxing. Lynettea read a few of my haiku at the State Library on Wednesday with her group, but she didn't say they were by me. She said that the authors were only mentioned together, not each haiku, but she showed me the video from her camera and I couldn't hear 'Diamond' mentioned. I think she is ashamed to acknowledge that I wrote some of the haiku. She let me use her picture dressed in a kimono, as she was one of the musicians for the reading. She isn't a proper musician - she just banged the gongs occasionally. The library may be putting a film of the readings on their web site. A pity that I won't be acknowledged, but I find there is such a lot of discrimination against cats. Now I am feeling better I will protest MIAOUWWWW MIAOUWWWW!!!!!! I wonder if anyone will listen. Lynettea said I could write a little bit, although I am spending most of my time lying in my basket, which she has put in the lounge room near my computer. For years the basket has been on top of the washing machine, but she got it down for me last night, as I only felt like sitting on the carpet, instead of jumping up onto one of my seats in the chairs. I didn't like it at the Vet Hospital. They gave me a cosy to sleep in which rolled over when I turned around and threw me out. Lynettea came to visit and told the nurse about me falling out of the cosy. They gave me chicken to eat - but I don't like it. And they kept sticking things into me, which they called enemas. I felt really poked about and pulled about and my arm was bandaged so stiffly with the drip that Lynettea thought it was a sticking out part of the cosy, until she saw a bit of my furs coming out the end of the bandage. I am trying to rest, so don't think I will write any more now. Thank you to my friends for all your wishes. Diamond is not feeling up to posting yet. He came home this afternoon after a lot of blood tests, fluid drip, injections for nausea and enemas. The Vet is still not sure exactly why Diamond was vomiting. He gave me some tablets and tried to give one of them to Diamond before we came home, then said he didn't realize a cat could hold a tablet in his mouth for so long and then spit it out. Diamond doesn't like tablets much. Eventually, after another try, he did swallow the tablet. I hope he takes them tomorrow. 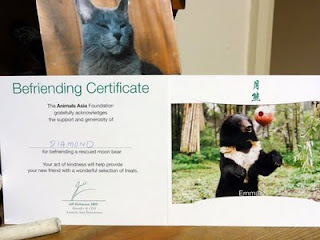 Thank you to all the kitties who wrote to Diamond. He is sitting quietly on the carpet now, but still hasn't used his litter tray properly. I visited Diamond in hospital this morning to take him some of his Kidney Diet food. He wasn't eating any of the chicken they had given him. He ate some of his regular food, picking at it slowly three times while I stayed with him. I was there about an hour. He spent quite a lot of time grooming, had a good patting session and was settling down for a nap when I left. He stayed in the cosy they had provided for him while I was there, but I could open the door of the container ward and reach in to pat him in the cosy. I think he is quite nervous, and not surprisingly, as he has an arm bandaged up with a drip and has had a couple of enemas and extensive blood tests. The blood tests show his kidney complaint, but they were not really bad. He is very blocked up with constipation and they are waiting to see if that clears. I have to ring at 3 pm for more discussion on his condition. Diamond asked me to keep his kitty friends posted. I am posting this message on behalf of Diamond. He suddenly had to go into hospital this evening and is staying overnight for some tests. I may know more later this evening. He is a very brave kitty. This is a nice resting place in my garden. I call it Fern Hollow. I am not sure why Lynettea made this little hollow for me. She ripped out a lot of the sword ferns, in her usual brutal fashion. 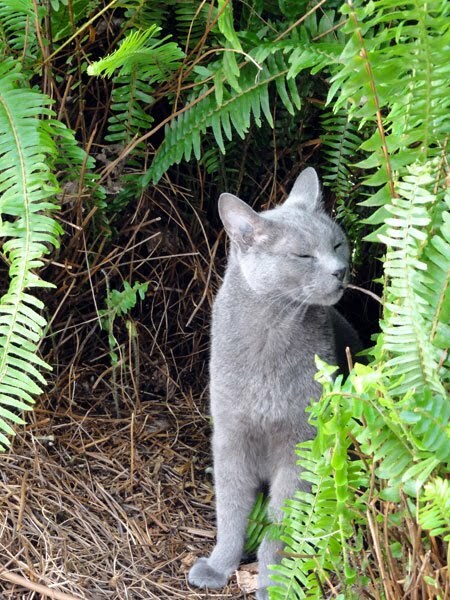 She may have been looking for rats or lizards, but gave up when she didn't find any. I quite like to poke around in here and it is cool on a hot day. Not that I go out much on a hot day, as it is too hot for Lynettea. I don't want to be responsible for her getting dehydrated. She is careless enough as it is. I have quite a big job supervising her. No wonder I get tired out. 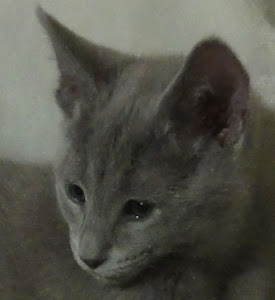 I heard we may be getting a new cat next door, but as it is going to be a house cat I might not see much of it. 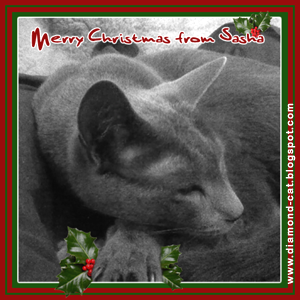 Just a note to Sanka, if he gets a chance to read this blog: I haven't heard from you Sanka and hope you are not shut in the shed. Sanka went to literacy classes, but seems not to be able to get to the computer. His human must be quite thoughtless. I am posting in a hurry, as the computer may be going away tomorrow. It may be a bit sick or something happened to its insides. I hope not too bad, as I rely on it for my correspondence. No pictures provided as yet. This morning I heard Lynettea mention the Vet. She must think I am stupid. Well as soon as she went outside to hang out some washing I went out and stood around. I usually just stand around and look at the pots and the vegetables and sniff at my grass or perhaps lie under a tree for a bit while she is outside. She thinks that if she keeps an eye on me I won't do anything she doesn't want me to. As soon as she went back for the second lot of washing I wandered off slowly down to the quince tree and I won't tell you what I did then, as Lynettea might see this and I don't want her to know. Well she couldn't find me anywhere and our neighbour also came in and they searched the house and garden. Finally I was sorry for her and came out. We went inside and I lay on my chair in the kitchen, but when she tried to pick me up I got really tense. My limbs spasmed. In spite of this she was able to put me in the pet carrier. I miaouwed all the way to the Vet. The taxi driver asked if I was ill.
We had to sit in the waiting room for a long time. Some dogs came in and out. This Vet specializes in large dogs, I think. They don't look all that smart, but their humans follow them around, so they can't be all that silly. One dog had a lady with silky hair that looked just like her. Finally the Vet got hold of me and took me to the BACK ROOM. I know about the secret room where they jab you with needles, but I didn't flinch.Useless struggle just wears you out. He told Lynettea I was a perfectly behaved cat. The Vet just rang to say all my blood tests were good. As I have not been able to get near the computer keyboard even to upload the comments from my loyal kitty friends. I have mostly been resting under protest. Only got one small and feeble looking raggy fabric mouse for Christmas, which is so long ago now. It amused me for around two and a half minutes. I did manage to telepathically stun a rat on the footpath at the side of our house. Lynettea nearly fell over it. And I was nearly able to stun a gecko on the kitchen ceiling with my thought waves, but Lynettea made me go into the bedroom and I had to sit on the bed in the dark dungeon while I could hear her scuttling around. When I finally got back to the kitchen the gecko had vanished. I can't see any improvement in Lynettea for the new year. Well 2011 already and I can't see any resolutions she has kept. The year rolls on. I might feel a bit less jaundiced if I get to post some pictures next time. The camera is full of splendid poses of me me me. 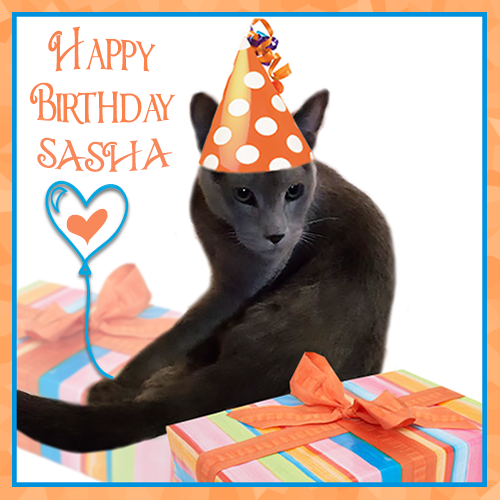 Thank you to the kitties who posted me delightful cards and greetings. I posted a card back to the Kitty Quartet: Keiko, Kenji, Pricilla and Yuji. I hope you got my card. I loved the little ginger kitten on the front and the little black kitty inside. Shumble from Wollongong and Sanker from Ipswich also sent greetings. Sanker has done really well at writing now he has taken literacy classes. This goes to show that it is never too late for a cat to improve himself. Sanker, I hope you managed to keep your humans under control during the flood and that you kept your furs dry.